This is Tamiya's 1/48 scale A-1H Skyraider. 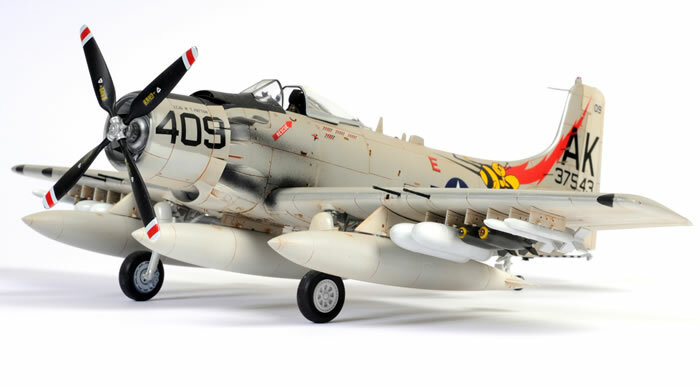 Tamiya's Skyraider is one of their best engineered kits. The only place that I used any filler on this kit was along the main fuselage seam line and this was in the form of Gunze Mr 500. I did replace the cockpit with the KMC resin cockpit as this had more detail than the kit cockpit. The remainder was straight out of the box. The paint scheme is done using Xtracolor Dark Gull Grey and Insignia White and the decals are the kit decals.